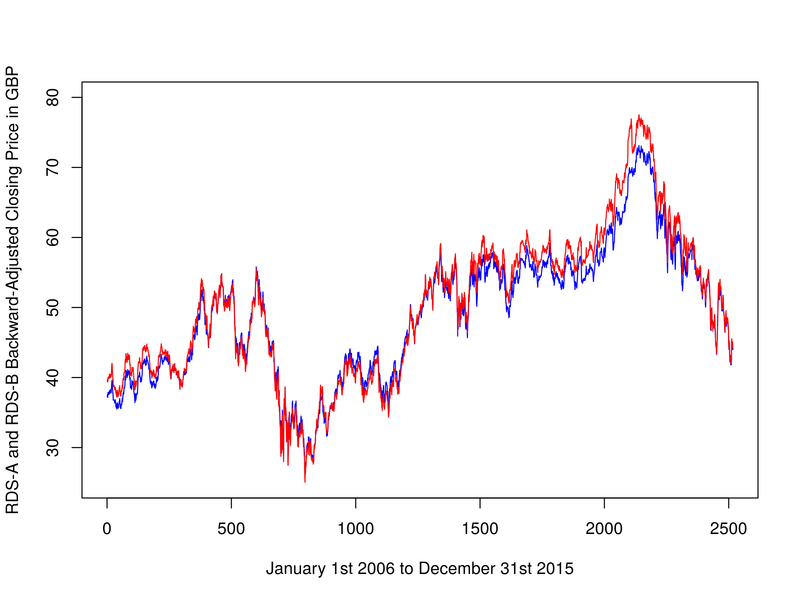 In the previous article on cointegration in R we simulated two non-stationary time series that formed a cointegrated pair under a specific linear combination. We made use of the statistical Augmented Dickey-Fuller, Phillips-Perron and Phillips-Ouliaris tests for the presence of unit roots and cointegration. A problem with the ADF test is that it does not provide us with the necessary $\beta$ regression parameter - the hedge ratio - for forming the linear combination of the two time series. In this article we are going to consider the Cointegrated Augmented Dickey-Fuller (CADF) procedure, which attempts to solve this problem. 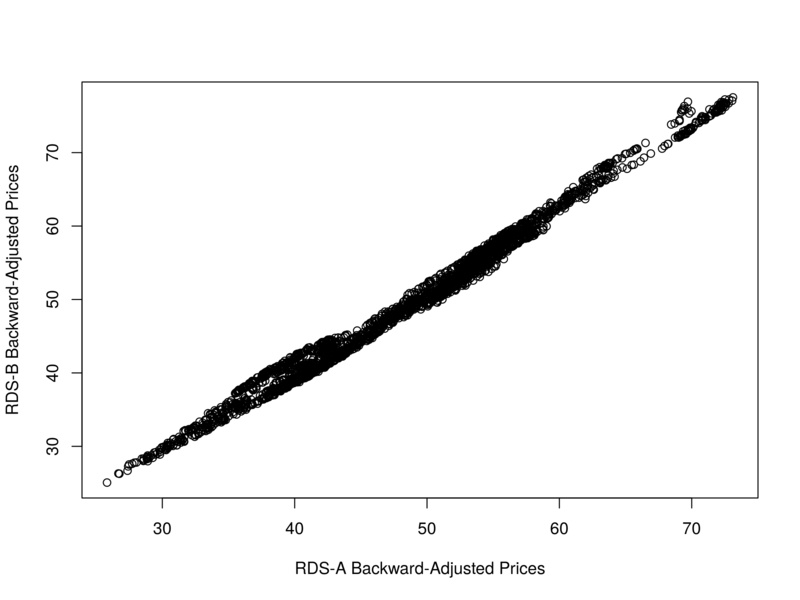 We've looked at CADF before using Python, but in this article we are going to implement our CADF function using R.
While CADF will help us identify the $\beta$ regression coefficient for our two series it will not tell us which of the two series is the dependent or independent variable for the regression. That is, the "response" value $Y$ from the "feature" $X$, in statistical machine learning parlance. We will show how to avoid this problem by calculating the test statistic in the ADF test and using it to determine which of the two regressions will correctly produce a stationary series. The main motivation for the CADF test is to determine an optimal hedging ratio to use between two pairs in a mean reversion trade, which was a problem that we identified with the analysis in the previous article. In essence it helps us determine how much of each pair to long and short when carrying out a pairs trade. The CADF is a relatively simple procedure. We take a sample of historical data for two assets and then perform a linear regression between them, which produces $\alpha$ and $\beta$ regression coefficients, representing the intercept and slope, respectively. The slope term helps us identify how much of each pair to relatively trade. Once the slope coefficient - the hedge ratio - has been obtained we can then perform an ADF test (as in the previous article) on the linear regression residuals in order to determine evidence of stationarity and hence cointegration. We will use R to carry out the CADF procedure, making use of the tseries and quantmod libraries for the ADF test and historical data acquisition, respectively. We will begin by constructing a synthetic data set, with known cointegrating properties, to see if the CADF procedure can recover the stationarity and hedging ratio. We will then apply the same analysis to some real historical future data, as a precursor to implementing some mean reversion trading strategies. We are now going to demonstrate the CADF approach on simulated data. 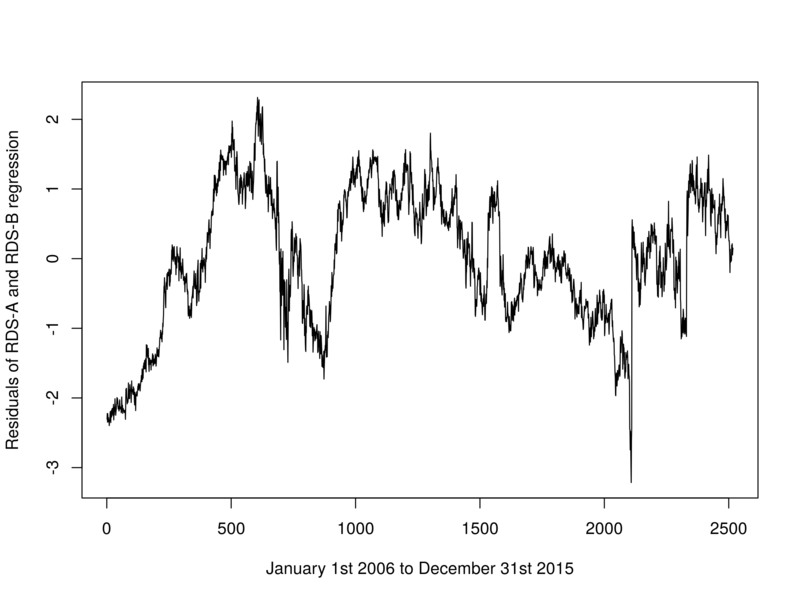 We will use the same simulated time series from the previous article. Recall that we artificially created two non-stationary time series that formed a stationary residual series under a specific linear combination. We can use the R linear model lm function to carry out a linear regression between the two series. This will provide us with an estimate for the regression coefficients and thus the optimal hedge ratio between the two series. The Dickey-Fuller test statistic is very low, providing us with a low p-value. We can likely reject the null hypothesis of the presence of a unit root and conclude that we have a stationary series and hence a cointegrated pair. This is clearly not surprising given that we simulated the data to have these properties in the first place. We are now going to apply the CADF procedure to multiple sets of historical financial data. There are many ways of forming a cointegrating set of assets. A common source is to use ETFs that track similar characteristics. A good example is an ETF representing a basket of gold mining firms paired with an ETF that tracks the spot price of gold. Similarly for crude oil or any other commodity. An alternative is to form tighter cointegrating pairs by considering separate share classes on the same stock, as with the Royal Dutch Shell example below. Another is the famous Berkshire Hathaway holding company, run by Warren Buffet and Charlie Munger, which also has A shares and B shares. However, in this instance we need to be careful because we must ask ourselves whether we would likely be able to form a profitable mean reversion trading strategy on such a pair, given how tight the cointegration is likely to be. 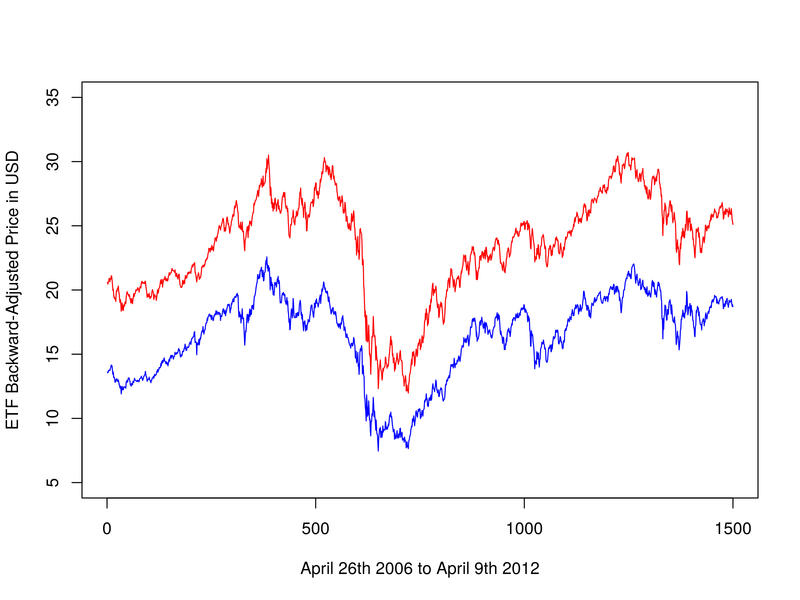 A famous example in the quant community of the CADF test applied to equities data is given by Ernie Chan. He forms a cointegrating pair from two ETFs, with ticker symbols EWA and EWC, representing a set of Australian and Canadian equities baskets, respectively. The logic is that both of these countries are heavily commodities based and so will likely have a similar underlying stochastic trend. Ernie makes uses of MatLab for his work, but this is an article about R. Hence I thought it would be instructive to utilise the same starting and ending dates for his historical analysis in order to see how the results compare. For completeness I will replicate the plots from Ernie's work, in order that you can see the same code in the R environment. Firstly, let's plot the adjusted ETF prices themselves. Once again we have evidence to reject the null hypothesis of the presence of a unit root, leading to evidence for a stationary series (and cointegrated pair) at the 5% level. 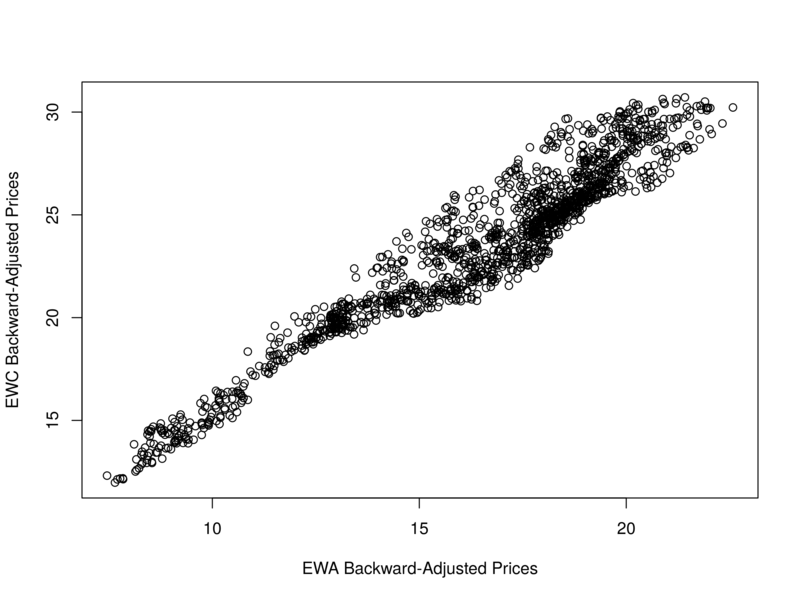 The ADF test statistic for EWC as the independent variable is smaller (more negative) than that for EWA as the independent variable and hence we will choose this as our linear combination for any future trading implementations. A common method of obtaining a strong cointegrated relationship is to take two publicly traded share classes of the same underlying equity. One such pair is given by the London-listed Royal Dutch Shell oil major, with its two share classes RDS-A and RDS-B. Since the first linear combination has the smallest Dickey-Fuller statistic, we conclude that this is the optimal linear regression. In any subsequent trading strategy we would utilise these regression coefficients for our relative long-short positioning. 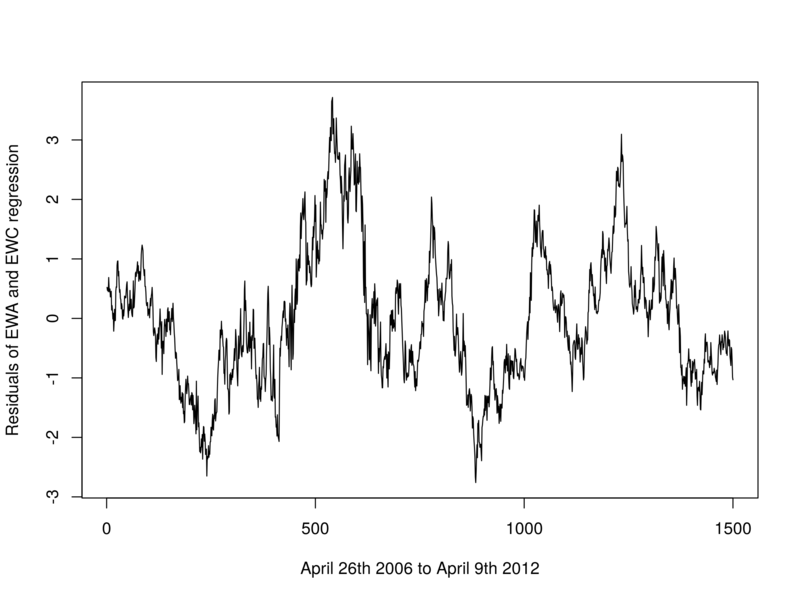 We have utilised the CADF to obtain the optimal hedge ratio for two cointegrated time series. In subsequent articles we will consider the Johansen test, which will allow us to form cointegrating time series for more than two assets, providing a much larger trading universe from which to pick strategies. In addition we will consider the fact that the hedge ratio itself is not stationary and as such will utilise techniques to update our hedge ratio as new information arrives. We can utilise the Bayesian approach of the Kalman Filter for this. Once we have examined these tests we will apply them to a set of trading strategies built in QSTrader and see how they perform with realistic transaction costs.